First edition ("Originalausgabe" is stated on the title page and on the back). The copyright is assigned for the year 1999 to the publisher. "Printed in Germany März 1999" is stated on the copyright page. Purchased by PV1 on 1999-03-17, ergo this pub. 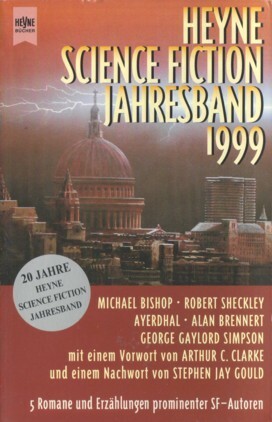 was part of Heyne's paperback program for April of 1999. For translators see the individual titles. The table of contents appears on pp. 5f. Other price: ÖS 145 (Austria).